A few years have passed since we first suggested that legendary confectioner Tootsie Roll Industries was ripe for a takeover. Strong brand name, solid balance sheet, rock solid profit margins, and aging owners all dovetailed into our analysis and theory that ultimately, one of the bigger fish such as Wrigley (WWY) or Hershey (HSY) would acquire Tootsie Roll. Even a stopped clock is right twice a day, but so far, we’ve come up short on this one. The reminder of our unrealized hypothesis was clear and smiling back at your Cheapstocks Editor a few days ago when Tootsie Roll’s latest annual report graced our afternoon mail. There, on page 2, in full color, I was greeted by those smiling faces. The faces of the Gordon’s, Melvin (age 85) and Ellen (age 77), looking youthful and happy, as if to say, “we are not going anywhere”. It is unbelievable just how good they look given their ages. Maybe excessive Tootsie Roll consumption is the secret to staying young. At a time in there lives when most have long since retired, Melvin and Ellen still sit at the top of the Tootsie Roll empire, Mel as Chairman and CEO, and Ellen as President and Chief Operating Officer. Not only do the Gordon's sit at the top, they also own a huge part of the company. As of the latest proxy statement, the couple controlled more than 80 percent of Tootsie Roll's class B shares (TROLB), and more than 40 percent of the common shares. The Class B shares have most of the voting rights: with 10 votes per share, while the common shares have one vote per share. If nothing else, its very clear that nothing happens at Tootsie Roll without the Gordon's approval. Tootsie Roll's recent results have been mediocre. 2006 sales were up just 1% to $496 million. Net income was $65.9 million, for a solid 13.3% net profit margin, but both figures were down from 2005s net income of $77.2 million, and 15.8% net margin. The company cited rising ingredient costs and energy prices for the margin pressure. Coming off the Concord Confectioners acquisition in 2004, (which surprised us, we thought TR was on autopilot) which drove much of the 16% sales growth from 2004 to 2005, it appears that Tootsie Roll is back in status quo land. Not necessarily great news for shareholders. As of 12/31/06, the company had $55.7 million in cash, $23.5 million in short-term investments, $51.6 million in long-term investments. If you add in the $73.4 million in split dollar life insurance, thats a total of $204.2 million, or $3.80 per share in cash and securities. Most notable on the liability side, there's just $7.5 million in long term debt, and postretirement healthcare liability of $12.6 million. When Will True Value be Realized? 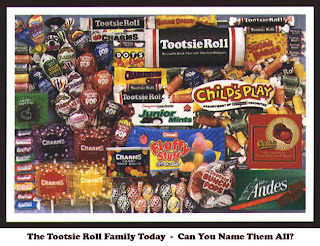 Tootsie Roll is a solid company, with great (albeit declining) margins, strong brand names, and a strong balance sheet. Yet, shareholders have not reaped the benefits in recent years. Share prices have essentially been flat since 2001, and the only returns have been via dividends. The ball is in the Gordon's court. They are in control, and have the power to enhance shareholder value through the sale of this company, whether through a private equity deal, or sale to one of the other major players (Hershey, Wrigley, Cadbury Schweppes). Giving credit where credit is due, Ellen Gordon has been an excellent spokesperson for the company in her frequent appearances on various Food Network shows. But its time to take this company to the next level. Shareholders are growing impatient. The problem is, there aren't enough non-Gordon shareholders to make a difference. Buyer beware, you get what you pay for, and herein is the downside to being a shareholder in a company largely controlled by one or two individuals. Its their company, you are just along for the ride, and can only hope they will do what's in the best interest of shareholders. *The author has a position in TR. This is neither a recommendation to buy or sell this security. All information provided believed to be reliable and presented for information purposes only.